Kamada, Tara's daughter, lives in a world of magic. A world of gremlins, fairies, an airavata-a spotless white elephant with four tusks and seven trunks-and talking magical entities shield her from a society where strange men act like they own the women walking down the street and where her mother sells her body in exchange for a life of luxury. Kamada knows she doesn't belong here. She is on a mission to escape the dirty streets of gritty Bombay and her mother's house, which feels like a prison. Only her magical friends, a parrot astrologer who tells of the future, and a neighboring family know that her dream is to leave home to study in America. As she plans her escape, Kamada's world is turned upside down when her mother reveals a secret and she must struggle to get the education she envisions. I received a free copy of this novel in exchange for an honest review. 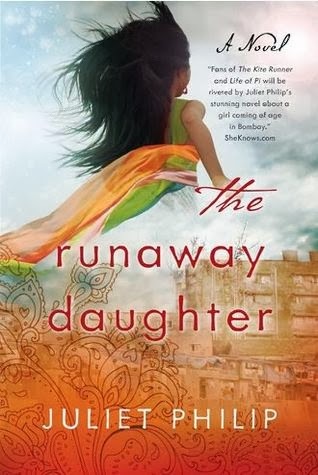 “The Runaway Daughter” is a beautiful coming of age novel. Kamada has great plans and big dreams of leaving her home in Bombay, India. She feels the need to escape the crowded, dirty city, and the life her mother leads as a prostitute. What keeps her sane is her overactive imagination, and the stories she makes up to help her. When her mother reveals a secret she has kept from her, Kamada will stop at nothing to make her dream a reality. This was such a poignant story. I can’t imagine growing up and having no one want me, but this was the case for Kamada. Her imagination was a bit to the extreme though, at some points I began to wonder if she was losing her mind. She teaches us to follow our dreams and never give up. I enjoyed this coming of age story and I’m sure you will too. Juliet Philip grew up doodling and scribbling whatever thoughts came to her mind. Growing up in coastal Bombay, India, Juliet moved to America after graduation. She now lives with her husband and their beige-colored stuffed dog in Herndon, Virginia. The Prostitute’s Daughter is Juliet’s first novel.